Life at an animal camp is always an adventure! But for those who want to step it up a bit, Cub Creek offers several specific adventure courses and classes that are aimed to please. 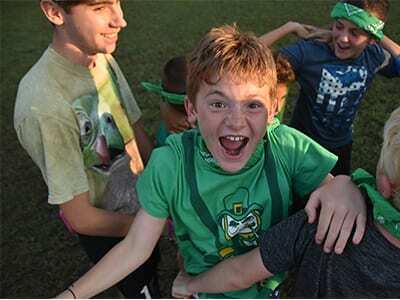 These activities are some of camp's most popular activities with full classes! They are offered multiple times a day and multiple times a week. Our Adventure activities offer a variety from our mostly animal and science based activities, but science is applied in all of them! The Ropes Course is a popular area of camp. Every year, our Ropes Course Facilitators and a Lead Ropes Instructor are trained and certified. Additionally, our ropes course facility, harnesses, and equipment are checked for safety. So, our Ropes Course is both safe and FUN! Although the name would imply different, all the elements of our Ropes Course are only offered as classes. Each day, campers can sign up for these activities during their class periods. The two activities that have age limits are found in the adventure program of camp: Riflery and Leap of Faith. You will notice in those descriptions **Senior Campers Only**, meaning that campers who are 12 and up may only participate in these activities for safety reasons. Look below for a list of our adventure related courses and classes. The six elements of our Ropes Course are sure to get your heart pumping! 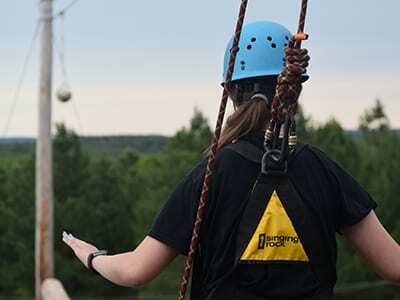 Zoom down our zipline, swing 50’ in the air on our giant swing, maneuver up the climbing wall, and build a camper's self confidence right alongside with their excitement! Zip Line - Definitely the most popular element of the Ropes Course, Zip Line offers an introduction to our elements. This wild ride takes campers all the way to the Back Pastures and right over Malachi the Camel! Rappel Wall - Campers will learn to safely descend from the top of the taller Ropes Course tower to the ground on their own! With the instructions from both Facilitators, campers gain confidence in the skills of rappelling. Big Swing - Also called the Giant Swing, a group of campers will work along with the Facilitator to help hoist each camper into the air using a pulley system! Once the camper being lifted has reached the desired height, they let go of their end of the pulley system, and go for a great swing! Leap of Faith - This element is the most daring on the Ropes Course! Campers will be placed in a full body harness, balancing their way as they walk out a horizontal pole, 30ft high! If they are able to make it to the end, they can take their leap of faith at hitting a ball hanging 6 feet past the end of the pole! Campers who take the Leap of Faith and hit the ball, get a special surprise! Because this element requires campers being able to safely fit into a body harness, it is only offered to **Senior Campers**. Crate Stacking - Starting from the ground up, campers are challenged to stack crates beneath them... as they as balance on their own tower! The current standing record for most crates stacked by a camper is at TWENTY SEVEN! Can you beat that? Climbing Wall - With both beginner and advanced options, the climbing walls in the Ropes Course offer campers a chance to practice a popular outdoor hobby. Campers who can make it to the top of the wall, can ring the bell, letting the whole camp know! Archery is the art, practice, or skill of propelling arrows with the use of a bow. At Cub Creek, this popular activity is offered to campers of all ages all summer long. Campers taking the week long course will learn the difference between precision and accuracy as they aim to become a skilled shooter. 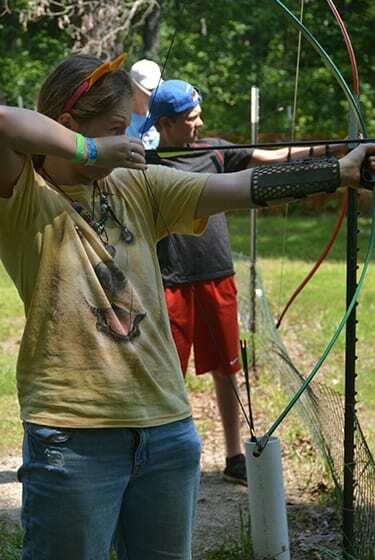 Campers enjoying a class of archery are able to enjoy the variety camp has to offer and shoot arrows for fun. Archery Basics and Safety - A full class is dedicated to the safety behind archery. 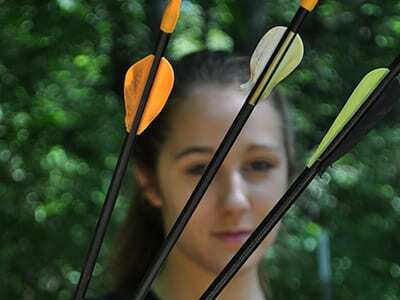 Campers learn the commands that the Instructors will give regarding collecting bows, loading their arrows, shooting, and collecting arrows from their targets. The rules of the range are laid out and expected to be followed all week. Target Practice - Through the course of the week, campers are given the chance to shoot and assess their skills. They will learn how to tally scores from their targets and aim higher! With different challenges and games, campers will be able to show off their abilities. Some campers will notice that they are really great accurate shooters by being able to shoot the ultimate target - the Bullseye. Others may notice that they are better precision shooters: hitting the same spot multiple times with intent. By the end of the week, we hope all will see improvements in their abilities! Ancient Archery, the Atlatl - We love to explore the history of a subject; We think that incorporates fun and learning! In the Archery course, campers will learn the Ancient predecessor to the bow and arrow and practice their hand at it! They'll discuss the pros and cons of this ancient technique while having fun! Riflery is an old camping tradition that we would like to keep going here at our camp. 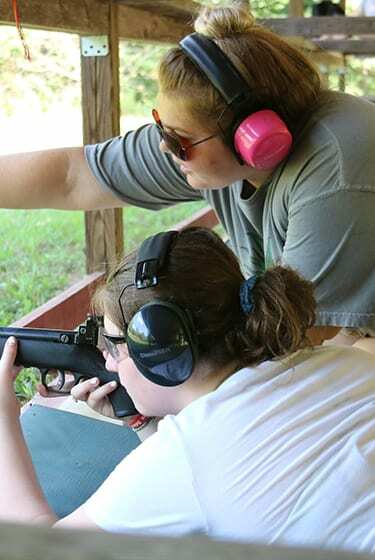 Riflery focuses on safely teaching campers the skills of marksmanship and responsibility. Campers shoot 22 caliber rifles from the comfort and safety of our covered riflery range. It is critical to us that safety is taken seriously. So this course has two Instructors to watch the class at all times, the class is limited to a certain number of campers, and all campers are required to follow strict commands. Because this course takes extra care and safety, riflery is only offered to **Senior Campers** and is only offered as a course. Rifle Safety - The entire first day of the course is dedicated to safety. 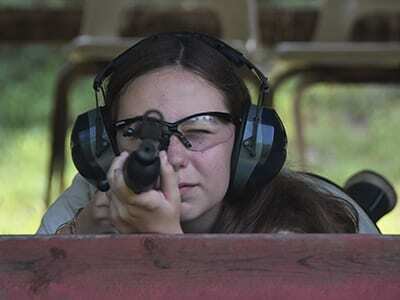 Campers will meet with the Instructors at our Range to go over commands, ear and eye protection, and handling rifles. Shooting - After the first day, campers will practice their marksmanship. With a target downrange, they will practice bettering their accuracy and score. Like Archery, the goal of Riflery is gaining skills and noticing your strengths. Riflery takes patience and a positive attitude! Rifle Cleaning and Care - Campers learn the importance of taking care of their rifle while in the class. This involves handling when both shooting and not, loading properly, and cleaning. Each camper is assigned a rifle during the week so that they take special care of it. Survival Skills is a hugely popular course here at camp. 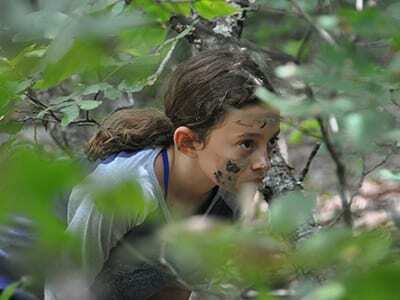 In this week long course, campers learn the basics of survival out in the wild! They'll learn how to find water, build a fire and create a shelter with very little help from modern conveniences. This all culminates in a voluntary survival campout, which allows campers to put their skills to the test! The Survival Skills course is so popular that their classes are also offered daily. Fire Starting - Though the goal is to learn how to start a fire with nothing but what you can find in the woods, in this class, campers learn the many ways that you possibly could! Beginning with what to use and how to place your materials, campers practice the different ways to create a sustainable fire. Shelter Building/Knot Tying - Using sticks, leaves, and tarps, campers are challenged to build a strong and sturdy shelter. With different methods, campers learn how to protect themselves for a night in the woods from all the elements. Searching for Food and Water - Critical to surviving in the woods is finding food and water! Campers will learn the many plants that are edible and rich enough to keep their energy up. Though we teach them how to find food, they are given basic meal rations on their Survival Campout! Orienteering and Signaling - Spending time in the woods requires attention to detail and knowledge of how to guide yourself without the help of a modern GPS! By using a map and a compass, you can go anywhere! Outdoor Cooking - This class exercises a culmination of all the skills gathered in our Survival Skills Course. Both Fire building and food gathering come into play to be able to successfully cook outdoors. Campers are provided with food, but are welcome to forage for their own, we leave building the fire and cooking the food right to them! 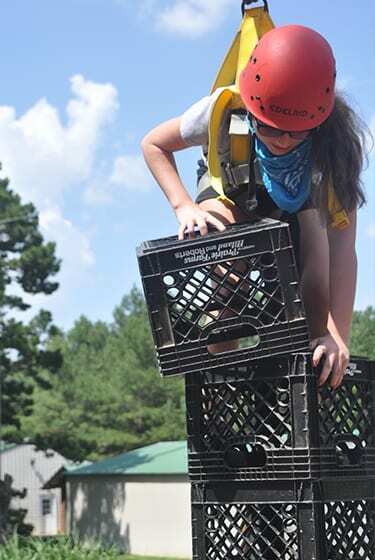 These activities are other Adventure classes that campers enjoy at Cub Creek. New adventure activities are also offered every summer, based on the interests and skills or our summer staff. Caving - Spencer Cave is a huge cave located on our extended camp property. It is about a 1/2 mile hike from base camp, but well worth the trip! This cave is lots of fun to explore and involves as much or as little mud as you like. Because of its vast size and side chambers, we offer two levels of cave exploration: basic and extreme caving. Both are two hour classes that allow campers to see and enjoy the cave formations as well as a variety of cave inhabitants, including bats and salamanders. 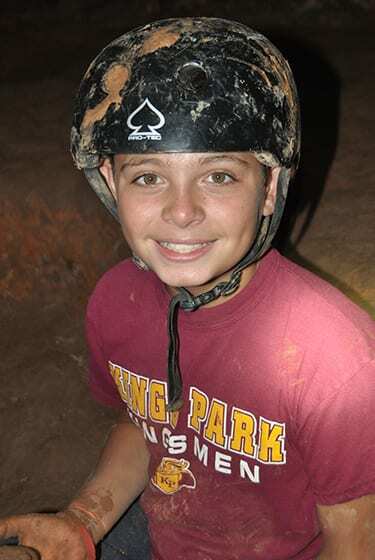 For the basic caving class, campers can walk through the cave with very little need to bend and not need to crawl, unless campers choose to explore the Banana Room, at the very end that requires a short crawl. Extreme caving explores a side tunnel and involves crawling through 3-4 foot tunnels that lead to a massive echo chamber room. Did you know that wintergreen lifesavers spark when you bite them, and that you can create sparks from static electricity when you rub a balloon across your hair? We try several short experiments while we have the advantage of complete darkness. 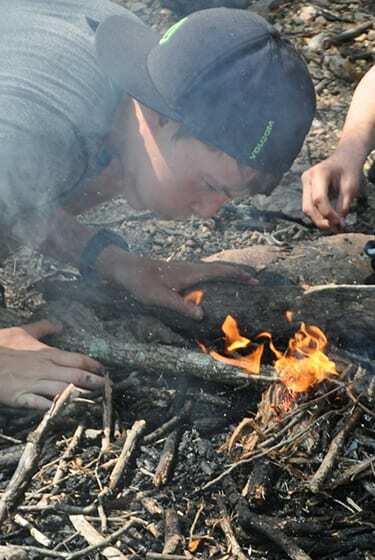 Survival Campout - Campers who are ready to test out the skills mastered in the Survival Skills are able to spend a night in the woods putting those skills to the test! Campers will build their own shelter, create and sustain a fire, and cook their dinner over their fire.